Dry and clear, abstract and fascinating. Brutter, an electronic duo consisting of two brothers, presents its debut with an eponymous, limited-edition LP. The result sounds as though a gigantic collection of machines has taken control over itself and has produced its own distinctive, confusing and tenacious dance music. Brutter’s debut album is available in a limited edition of 300 numbered copies as a white-label LP with a downloading code. Zwei Brüder aus Norwegen machen als Brutter absonderliche elektronische Musik zwischen Experiment und Dancefloor. Der eine Bruder, Fredrik Wallumrød, ist Schlagzeuger und spielt eher im Rock- und Metal-Umfeld bei Bands wie Span, El Caco und Dog Almighty. Der andere Bruder ist Christian Wallumrød, der mit seinem eigenen Ensemble und dem Quartett Dans Les Arbres mehrere Alben auf dem Avantgarde-Jazz-Label ECM veröffentlicht hat und sich sowohl in akustischer als auch in elektronisch frei improvisierter Musik zuhause fühlt. »Nrutter« nun umfasst drei live eingespielt und improvisiert klingende holpernde und stolpernde Tracks voll klarer elektronische Klänge ohne Effekte oder Hallräume, unterlegt von hakeligen, miteinander kämpfenden und kollidierenden, pulsierenden Beats. Die Musik wirkt dabei stets, als würde ein Haufen elektronischer Klangerzeuger eine Mathrock-Noise-Band imitieren und dabei fast straighte Rhythmen und fast groovende Tanzmusik für Menschen mit drei Beinen erzeugen. Aber eben nur fast. Die Brüder Wallumrød vermeiden hier eine gute halbe Stunde konsequent jeglichen geraden Beat und schaffen dadurch eine auf Dauer recht unangenehm angespannte, gleichzeitig interessante Atmosphäre, die sich die ganze Zeit auf einen sich nicht einstellen wollenden Höhepunkt aufschaukelt. Tym razem perkusja w roli głównej. Dwa różne spojrzenia na rytm i harmonię, ale oba wyjątkowe!Ci bracia nie tylko dobrze wypadają na zdjęciu, ale co ważne, kapitalnie dogadują się w sprawach muzycznych. Na początku tego roku recenzowałem pierwszy solowy krążek Christiana Wallumrøda – „Pianokammer” (Hubro), choć ten artysta ma już spore doświadczenie, jeśli chodzi o nagrywanie znaczących płyt (od wielu lat wydaje swoje nagrania pod szyldem Christian Wallumrød Ensemble – wszystkie albumy tego projektu ukazały się nakładem oficyny ECM, a także udziela się w kwartecie Dans Les Arbres). Z kolei jego brata Fredrika (perkusja, elektronika) należy bardziej kojarzyć z norweską sceną rockowo-metalową (gra w Span, El Caco, Dog Almighty). Na longplayu „Brutter” abstrakcyjne formy rytmiczne w wykonaniu Fredrika, w zestawieniu z syntezatorami, elektroniką i automatami perkusyjnymi Christiana tworzą naprawdę świeżą całość. Śmiem twierdzić, iż muzycy przedstawili swoją wizję muzyki tanecznej, lecz w najbardziej awangardowej odmianie. Obcowanie z twórczością Norwegów to bardzo inspirujące doświadczenie. Brutter er et originalt, norsk prosjekt gjort av brødrene Christian og Fredrik Wallumrød… Det er fascinerende lytting, og jeg er glad for at de to brødrene har gått til det skritt å spille sammen, og at Andreas Mæland på Hubro ville gi det ut på plate. Christian og Fredrik er brødre. Brødrene Wallumrød er Brutter. Brutter er en elektronisk duo som nekter å uttrykke seg på vegne av noen spesifikk sjanger. Det blir det spennende musikk av. Jeg er ikke overrasket over at nettopp disse brutterne får det til. Fredrik er metal- og rockmusiker og spiller med Jarle Bernhoft og Susanna. Christian er blant de mest spennende utøverne i vår tid. Close Erase, Merriwinkle, Dans Les Arbres og Christian Wallumrød Ensemble har gitt lys de siste tiårene. Musikken til Brutter er hverken saftig eller fet. Den er snarere spartansk og transparent. Brødrene spiller trommer, trommemaskiner, synther og elektronikk, og de lydene som produseres, bærer på underfundighet. Den som er på jakt etter en melodi å plystre, har lite å hente hos Brutter. Vi som har sans for vrien rytmikk og uforutsigbare pulsslag, har derimot mye å ta av. Det låter usedvanlig friskt på sin egen, innadvendte måte. De to åpner en verden jeg har følelsen av å besøke for første gang. Opplevelsen av å møte noe nyskapt følger meg gjennom de tre låtene på albumet. De skraper, dasker og risler seg gjennom «Geigered», og måten de gjør det på, avler abstraksjoner. Det er suggererende og dystert og gjort med en kresenhet som imponerer, uten mange solglimt og plagsom varme. Brutter er sommerens album for meg. Kein Monat ohne eine kleine Sensation vom norwegischen Uhu(=Hubro): Das Brüderpaar Wallumrød untersucht auf seiner Debut-LP hochkonzentriert und doch mit einigen Freihetsgraden rytmische Strukturen, die aud “echten” und wohl auch vermittels elektronischer drum-sets erzeugt wurden. Reine, pure, solitäre Trommeklänge, kaum (nach)bearbeitet, organisiert und zugleich stochatisch anmutend. Dazu einige sehr dezente elektronische Störungen im KlangFeld. Schon der jeweilige Titel der drei Stücke (Gesamtspielzeit 34 Min.) weist in eine bestimmte Richtung: Geigered / Radiopuls / Badminton Bleak. Das Ergebnis ist extrem überzeugend und dürfte auch live ein grosses HörErlebniz darstellen. Und wer bei “Wallumrød” und “Debut” anfangs etwas gezuckt hat, liegt natürlich richtig. Christian W. hat schon mit 25 seine erste CD für ECM eingespielt und ist sowohl mit seinem Ensemble wie auch mit Dans Les Arbres eine feste Grösse bei den Münchnern. Melodikk i tradisjonell forstand er fraværende, mens rytmer – som ofte kolliderer – og pulserende beats spiller en hovedrolle. Jovisst er dette krevende musikk, men aller mest er den utfordrende og ustanselig spennende. Brothers Christian and Fredrik from the musical Norwegian Wallumrød family team up on Brutter, their first release as a duo. Christian has a background in church music and jazz and has his own acclaimed ensemble that records his modern compositions for the revered ECM label, while last year saw his debut solo release of “multi-dimensional chamber music” on the same label. In contrast, Fredrik sits on the rockier side of the tracks, lending his drumming to garage metal bands Span, El Caco and Dog Almighty as well as to their sister, Susanna’s dreamier, poppier songcraft. The three tracks that form Brutter sit right in the middle of these fraternal experiences to explore avant-garde composition through percussion alone. ‘Geigered’s title, by suggesting the crackling machine whose rising frequency denotes increasing radiation levels, hands its listeners a concept to help guide them through what is so original and unusual it might otherwise be incomprehensible. Brutter’s damaged drum machines and unstable electronics often seem to be conspiring to form a regular rhythm, but with serial false starts the incongruent Geiger counting seems designed to irritate anyone expecting anything approaching fluidity.A similar, attritional atmosphere is found on the short, second piece, ‘Radiopuls’. Although Christian’s dry, jazz-angled drum machine does get complemented by Fredrik’s live drums – itself a rare combination to behold – they seem to fall apart as soon as regularity sets in. Stubborn arrhythmia reigns for the closing piece, ‘Badminton Bleak’, but by this stage ears begin to get accustomed to their novel interplay. Instead of rhythms the players are seeking and transforming textures, like Geiger counters seek radiation, their chaotic collisions never intended to inspire the, literally, knee-jerk reaction of toe-tapping. In this way Brutter feels like an exercise in changing ones mental gears to stop anticipating rhythm and to begin to appreciate the other qualities served and returned between the two players. Brutter is just enough. Brutter is just two brothers, Christian and Fredrik Wallumrod. The record is called Brutter. Doesn’t Brutter have an interesting sound to it? The rhythms on the record are stubborn and staccato, neither wholly electronic nor all instrumental, and the way it’s mixed, you can’t tell where one ends and the other begins. This record sort of sounds like how thinking feels. “Geigered” builds up from wet bass murmurs to a complex rhythmic showcase that had me entranced. It takes these frustrating, arrogant little rhythms — off-beat kicks, dense bass plucks, hi-hats like someone knocking angrily on your door, everything out of sync — and manages to structure them together so that it’s just barely not a mess. It pulls them into orbit, then lets them swing out. Brutter isn’t really a beat anyone can dance to in the traditional sense. There is too much off-kilter squawking and ping-ponging. The beat this band makes never uses any standard timings. It’s more as if the drums are speaking. The rhythms on Brutter contract, phase, and expand. It’s a conversation, being passed around a few different samples, an agreement being reached. A song gradually develops by consensus, it seems, then refines itself with each repetition, then changes the subject, then disagrees again, etc. “Radiopuls” is half the things you want to avoid in a recording: all the feedback, all the dryness, all the muddy lows and fry of the instruments and weird microphone placement; all the false takes and bad starts before a totally different song. But with some well-placed snares and squawks and it becomes an engrossing experiment. Small musical sentences are pulled out of distorted, unlikely, and damp places. A few bursts of sonic clutter happen at aesthetically-appealing intervals. The simplest, plainest events are being presented as the entire musical picture, and yet Brutter make it convincing with their confidence, never slipping, steadily ascending a towering mass of insouciant drumplay. The Hubro press release describes Brutter almost as if an algorithm or a machine were generating its own dance music, and I’d have to agree. The way each note corresponds and contributes to each song feels very skeletal, very essential, chosen for efficiency but not always musicality. “Badminton Bleak” has an opening few minutes that are simply bass notes rising and falling, shifting off slightly for a flat cross-stick or two. It just skirts the line between a sort of subterranean groove and inert nothingness, but it never goes over that line either way, not all the way. Nothing ever slips out of place. Brutter’s kind of comforting like that, even with its harshness and skewed positioning. If in fact Brutter is not actually a music-generating algorithm on a computer somewhere, and it is actually two brothers, it’s incredible that they’re able to sustain these conflicting musical tensions on so little material, in so strange an order, without ever dropping the beat. Brutter is a stubborn and well-crafted collision of dense sound, all timbre and rumble, all deep hum and purr and potential energy, but forever patient. Brutter’s like a car easing along a flat road. Someone’s applying just a little gas here and there to push it along, just enough at just the right time to keep the ride going smooth. “Brutter brutter brutter,” the car says. Derrière Brutter se cachent les frères Christian et Fredrik Wallumrød, qui sortent leur premier album ensemble en tant que duo, mais qui ont chacun une longue vie de musiciens derrière eux, que ce soit dans la sène électro-acoustique, metal ou expérimentale. Avec ce premier 3 titres, les norvégiens déploient un arsenal de sonorités difficilement identifiables, tant les machines et instruments organiques forment un tout fusionnel à la rugosité dense et compacte, dégageant une force brutale et frontale qui délimitent de nouvelles frontières aux croisements des musiques indus et expérimentales, gorgées de rythmiques cabossées aux fluctuations algorithmiques indescriptibles. Brutter manipule la matière tel un alchimiste, brisant le diamant pour en extraire une pierre à la lumière profonde, enrobée d’un coeur noir aux nervures sanguines palpitantes. Un voyage dans les profondeurs de l’inconnu, entre Enfer de Dante et monde de Cthulhu de Lovecraft, dérive hypnotique sur une mer au calme démonté et aux courants souterrains happants. Vital. Once upon time brotherhood in music was mainly associated to blues, rock and pop. This reunion between Norwegian sonic siblings Fredrik Wallumrod, who mainly borrowed his skills on drums and electronics to rock and metal bands such as Dog Almighty, Span and El Caco, and Christian Wallumrod, who became one of the most appreciated musician of the Nordic improv scene – I recently introduced the amazing output “Pianokammer” by this musician, whose name got mainly matched to his own acoustic ensemble and the quartet Dans Les Arbres – extends the concept to the more experimental side of improv music. Forget the piano tones, harmonic moulding and melodic mutations you met on the above-mentioned “Pianokammer”, as Christian mainly works on likewise freaky sonic palettes over the three tracks of “Brutter” by a pile of percussive plugs, hits and filters according to evasive logical paths, where Frederik adds some electronic foil, whose amalgamation can’t really provide a semblance of order to the resounding elements. The initial “Geigered” sounds like a set of false starts, where any “regular” rhythmical pattern got immediately disbanded within hiccuping and sometimes chaotic surges, which are the dominant aspect of Brutter’s sound on the interplay “Radiopuls”, an intentionally impossible attempt of matching between drum machines and live drums, which seem to be part of an impossible interlocking puzzle. Any possible synchronization between the two halves of the drumming got broken in the asynchronous slow syncopations of the final “Badminton Break”, where you could imagine Wallumrod Bros dragging rhythm like the body of a drunken fool into a temporary shelter. 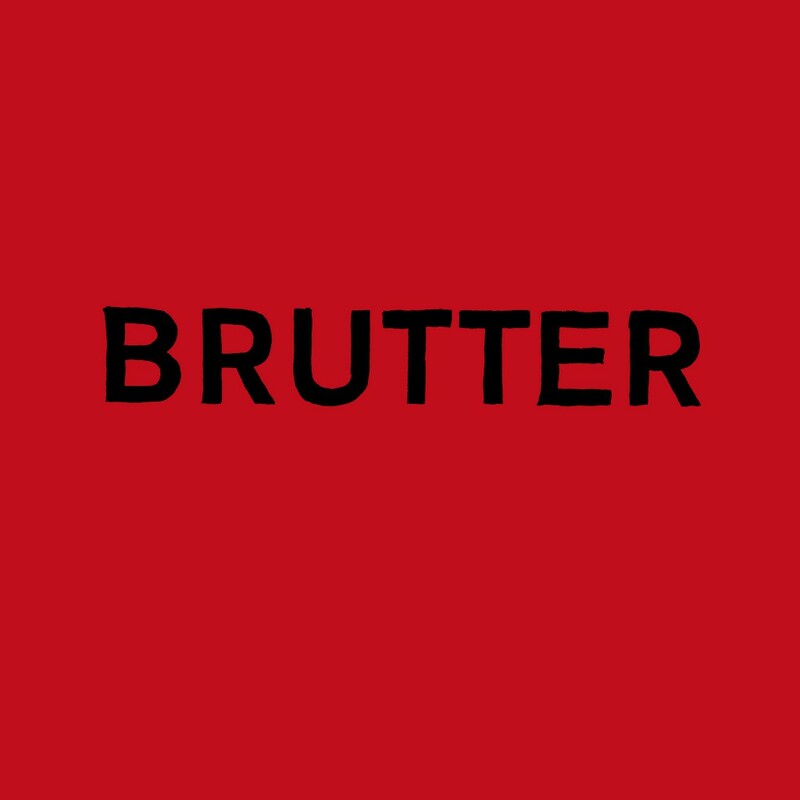 Brutter is an electronic duo featuring Norwegian brothers. Pianist Christian Wallumrod is known for his acoustic ensemble and the quartet Dans Les Arbres. Both groups released acclaimed albums on the ECM label. Drummer Fredrik Wallumrød is known primarily as a rock or metal musician. On Brutter, Christian abandons the piano and plays on drum machines, synthesizer and electronics while Fredrik adds further electronics to his sonic palette. They are joined on this recording by their sister, the vocalist Susanna Wallumrod. Nothing in Christian Wallumrød’s rich discography fits into the dry and abstract vision of Brutter, not even his improvised work with the trio Merriwinkle (which includes vocalist Sidsel Endresen and sound artist Helge Sten). The three pieces on the Wallumrod brothers’ limited-edition vinyl debut don’t attempt to sketch even a fragment of melody, harmony or pulse. These pieces opt for a confrontational atmosphere rooted in industrial, machine-made distortion. The long, opening piece “Geigered,” sounds like an experiment using prepared industrial-electronics sound. These sounds are cold and disturbing, suggesting chaotic, malfunctioned false starts colliding and exploding with no sense of structure or flow. There is a brief attempt to match the live drums with drum machines on the second, short “Radiopuls,” but it disintegrates before it gains any real sense of motion. The final, extended piece, “Badminton Bleak,” focuses on stubbornly breaking any trace of rhythmic interplay, coincidentally managing to suggest a weird kind of impossible, disturbing pulse. Still, Brutter manages to offer a provocative and alien sonic experience. Obviously, it is not intended for the faint-hearted.